Want a way to know Jesus more? As Christians we are commanded to live as Jesus lived. But how can we model ourselves after him unless we truly know him? 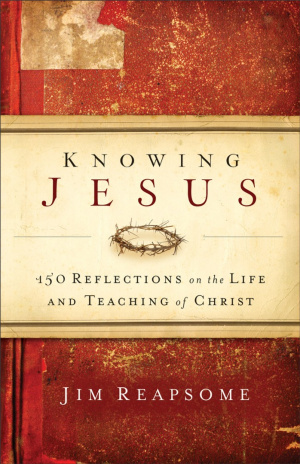 Knowing Jesus offers you 150 biblically based reflections that illuminate the life of Christ, as well as his heart for people and the world. This engaging devotional helps you ponder the question of what Jesus has to say to his followers living in this troubled and hurting world. Explore some of his most important teachings and discover how Jesus calls each of us to look beyond ourselves and serve as he did. Each brief devotion dives deeply into Scripture for fresh insights into Jesus's life, teachings, and character. Reflection questions and a brief prayer inspire you to not only love Jesus more, but also become more like him every day. If you're looking for a renewed passion for Jesus himself and a deeper understanding of his life, look no further. Knowing Jesus by Jim Reapsome was published by Baker in November 2012 and is our 35591st best seller. The ISBN for Knowing Jesus is 9780801014260. Got a question? No problem! Just click here to ask us about Knowing Jesus.